"Apple has a 10% restocking fee on opened non-defective products, but AT&T seems to think that this applies to iPhones that are defective right out of the box." "It's the best portable media player ever. It's possibly the most fun we've ever had with a handheld device. It browses the Web like a champ. Yet as a voice phone and a messaging device, it's a loser. The iPhone is full of contradictions." "Succumbing to the hype and buying one of the most buzzed-about consumer products in ages - from a corporate titan like Apple, no less - doesn't exactly scream 'Stick it to the man!' yet I've been feeling like a bit of a rebel since buying my iPhone. "True enough. But if you simply can't wait until Rogers (the only wireless carrier in Canada whose network supports the iPhone's technology) starts selling it here - and it still hasn't announced when or even if that might be - there's no reason that, with a little resourcefulness, you can't get your hands on the most highly coveted high-tech gift of the year." "Updated Orange France will sell Apple's iPhone to consumers who don't want to be tied to the carrier, provided they cough up €749 for the handset - €250 less than T-Mobile Germany's unlocked iPhones cost. "Orange said it will offer four iPhone-oriented price plans ranging from €49 to €119 per month. Data usage is capped at 500 MB a month, and the carrier admitted that 'modem access, VoIP, P2P and [bizarrely] newsgroup usage is strictly forbidden', though that's over Edge connections rather than the handset's built-in Wi-Fi link." All juiced up and ready to go . . . straight out of the box! Save the hassle and double the power! The Mophie Juice Pack comes all charged up and ready to go straight out of the box! Never experience the downtime with your iPhone - Simply plug in your iPhone to the fully pre-charged Juice Pack and doubles the time to rock, talk, surf and send! Save the hassle and additional costs to exchange the battery through manufacturer. With Juice Pack, you can charge your battery anytime as needed. Safety first - The Juice Pack utilizes a very safe and advanced rechargeable lithium-polymer battery cell. There is a build-in circuit to prevent the Juice Pack from being shorting, over charge and misbehaving under extreme weather conditions. Hi Energy Cell - The battery cell is highly condensed and is able to store and deliver very high energy in a small and compact package. There are 4 light LEDs on the back of the Juice Pack. Simply press the test button and it will tell you how much power is left with the Juice Pack. The LED lights also indicate the charging status and the charging progress. PR: Music lifestyle brand V-MODA has announced the addition of five colors to its popular VIBE Duo, VIBE and Bass Fréq modaphone lines. VIBE Duo, the dual-use headphone/headset for the iPhone, is now available in new Chrome and Gunmetal Rouge. VIBE, V-MODA's luxury earphone line, is available in new Midnight Blue, and the award-winning Bass Fréq collection debuts Jaded and Rouge to match the new green and (PRODUCT) Red Special Edition iPod nano and shuffle. According to Val Kolton, CEO and founder of V-MODA, the brand is heeding the call from consumers to continuously introduce fashion-forward colors that complement the latest MP3 players and other technology. "Fashion and design epitomize both the V-MODA brand and our products, so it's only natural that we regularly update our earphone colors to appeal to a variety of tastes as well as to complement the latest technology," Kolton said. 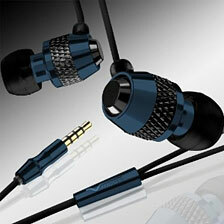 "Earphones have quickly become the quintessential accessory for everyday life. There's a whole new world out there beyond the ubiquitous white earphone, and we're happy we can provide our discerning consumers a choice in the type of earphone they choose, as well as the color that best matches their personality and technology." V-MODA's VIBE Duo is a noise-isolating dual-use headphone/headset designed to accessorize the Apple iPhone. The VIBE Duo, which features control-playback functionality, features a discreet microphone with a call button, allowing users to take calls and control the music functions of the iPhone with handsfree convenience. Durable black fabric cables and a minimalist all-metal design round-out the mix of premium features. 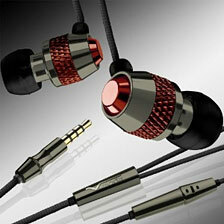 In addition to Chrome and Gunmetal Rouge, VIBE Duo is also available in Nero. The VIBE line of luxury modaphones features all-metal craftsmanship and an array of colors, from Flashblack Chrome to Red Roxx to the new Midnight Blue. Like VIBE Duo, the style and sophistication of VIBE earphones are on par with high-fashion jewelry and boast a lightweight, unobtrusive design. Built for the modern, active lifestyle, Bass Fréq earphones offer a comfortable, lightweight and secure fit during any activity. The earphones received CNet's prestigious Editor's Choice Award for their overall sound quality and consumer-friendly price point. In addition to Jaded and Rouge, Bass Fréq is available in several colors including That's Hot Pink, Blue Steel and Rocker Red. All of V-MODA's in-ear headphones feature BLISS (Bass Level Isolating Soft Silicon) technology, which reduces outside noise to produce a precise and rich bass response (frequency 12 Hz to 22 Hz). The V-MODA modaphones come with three sizes of soft silicon fittings to ensure a perfect fit and help block out unwanted sound. VIBE Duo headphone/headsets and VIBE luxury earphones are available now for $99.99 and can be found in the US at the Apple Store, and in Europe at the Apple Europe Store and John Lewis stores. They can also be found online at Apple.com, Amazon.com, and Shop V-MODA. Bass Fréq earphones are available for $39.99 and can be found at a variety of online retailers, including Amazon.com, Target.com, and Shop V-MODA. All V-MODA products are backed by a 100 percent risk-free satisfaction guarantee, and free shipping in the US is available for a limited time only. Visit v-moda.com for more information on pricing and retail availability. GizMac Accessories, designer and manufacturer of innovative products for the iPod and iPhone, announce their upcoming Titan Clear iPhone case with holster. Building on the success of the Titan product line, GizMac has once again designed a creative solution that should exceed customer expectations. 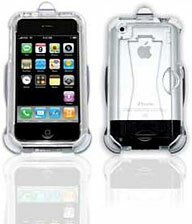 GizMac's Titan Clear for iPhone is a protective case that can be used alone or combined with the included quick release holster. "We wanted the Titan Clear for iPhone to have the best form, function and value" explained Mark Kirtner, Creative Director for GizMac Accessories, "So we delayed our release until the Titan Clear had the best over all look, usability and price for our customers." 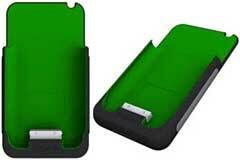 Well planned engineering from GizMac has produced an iPhone case that will protect as well as impress. The Titan Clear case protects the iPhone with its tough, crystal clear polycarbonate shell, but still allows the Apple iPhone's striking appearance to show through. 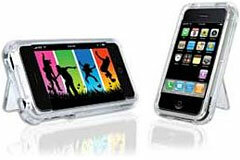 The addition of a thin film screen protector completes the Titan Clear case protection by keeping the iPhone screen safe. Retractable horizontal and vertical kickstands are built into the Titan Clear iPhone case. These innovative kickstands can be used to adjust the horizontal and vertical angles of the case for optimum iPhone viewing. Movies, videos, calls, messages and more can be better viewed when the angle of the screen is adjusted for personal preference. The Titan Clear for iPhone will retail for $34.99 US and will be available in early December. 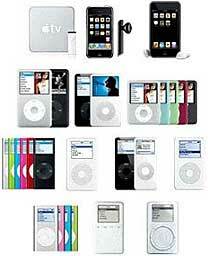 Additionally, iPhoneDrive provides easy access to your iTunes media, iPhoto albums and notes. Simply drag music, videos and notes from the iPhone or iPod Touch to your desktop or simply double-click to copy. File Storage Made Easy - iPhoneDrive's familiar Mac OS X interface makes it simple to transfer files between your Mac and your iPhone. Just drag and drop files between the iPhoneDrive window and your desktop, or use the iPhoneDrive toolbar. Storing files on your iPhone enables you to use your iPhone's unused storage space as a disk drive to backup data or transfer between Macs. Note: The iPhone does not allow you to access files stored using iPhoneDrive. Simple Notes Access - iPhoneDrive is the easiest and quickest way to access your iPhone's Notes on your Mac desktop. Simply connect any iPhone and double-click notes to open them in your favorite text editor. Recover From Disaster - In the event of a Mac disk crash, if your music and photos are safely stored on your phone, iPhoneDrive is the easiest path to recovery. Access music, videos, podcasts and photos. Instant access to iPhone Notes from your Mac. Use your iPhone for backup. Bring your data between home and office. Full compatibility with all iPhone and iPod Touch firmware. Adds notes access. Advanced mode will now show hidden files. Fixes a photo access issue that could cause photos to show up as "Unknown" on some iPhones. iPhoneDrive v1.3 Demo resets the demo period, allowing users who tried earlier versions to have a new trial. The newest version of iParrot is released. Now iParrot support all iPod (except iPod shuffle), iPhone and Apple TV. User can use iParrot in two ways: "Music Mode" and "Notes Mode". The "Music Mode" support all device, the "Notes Mode" support iPods that have Notes Reader feature. iParrot sets a new standard for instant multi-language translation software. Designed for the iPod, iPhone and Apple TV, it's stocked with over 20 kinds of perfectly pronounced oral language for instant use. iParrot is organized into categories such as: Greetings, Transportation, Shopping, and Asking for helping etc. So it is enough for you to find the sentences you need instantly. Organized for instant access and ease, it is especially useful while traveling abroad. Virtual fluency available in Chinese, English, Japanese, Russian, French, German, Spanish, Italian, Korean, Portuguese, Thai and Vietnamese.